However, when it comes to PR, there are some subtle yet significant differences to what might be considered out-and-out marketing. PR people don’t buy adverts – that’s the marketing department’s job. They also don’t do things like hand out free samples at the shopping centre in town. They don’t order journalists to write favourable stories for the print or online media. And they certainly don’t produce infomercials or radio jingles. I make this point because these assumptions are not uncommon – so let’s clarify exactly what it is that PR people really do (or at least are supposed to do). Communication. That’s the key-word in the definition. PR is about telling stories, about creating narratives that connect positively with key audiences and enhance the organisation’s overall agenda. PR people are image shapers, and their aim is to create positive publicity for their clients through trusted, not paid, sources – be it the traditional media, social media, or speaking engagements. Sometimes, however, PR can go drastically wrong. And when it does, although publicity levels can often go through the roof, they do so for all the wrong reasons. There are countless examples of global companies that should know better making egregious gaffes in the public sphere. But the good news for us is that we can learn from these mistakes – so let’s take a look at three PR fails that have made the headlines over the years, and consider what lessons can be learned. In business, sometimes things go wrong. It’s not unheard of, for instance, for a certain line of products to come out of the warehouse with a few faults that need to be addressed. When this happens, it’s imperative that the company responsible acts quickly, owns up to the mistake, and offers a solution to disappointed customers. This would be good PR. 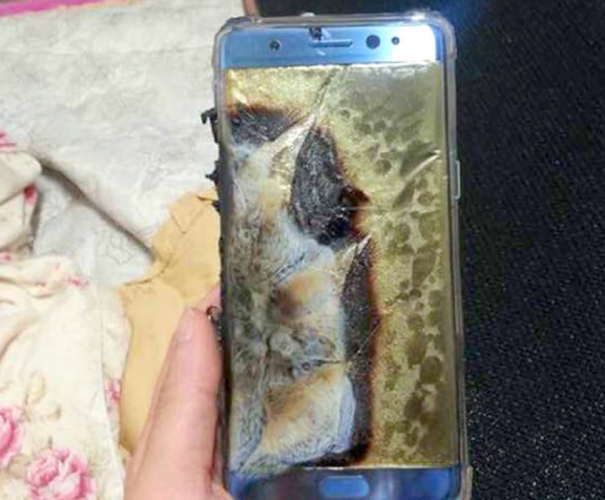 But last year, when Samsung began receiving reports that its flagship Galaxy Note 7 smartphones were catching fire whilst charging, it has to be said that the Korean tech giant took the wrong approach. For starters, giving the severity of the situation, Samsung should have been much more transparent from the word go. The initial notification of the fault started simply as an easy-to-miss tab on the Samsung website, which suggested that customers take their phones back to where they bought them in exchange for a refund (thusly extending the crisis to carriers). Meanwhile, however, people’s new phones were still catching fire. It was only days later that this incredibly important news began to feature prominently on Samsung’s main homepage, alerts were sent to all consumers across social channels, and the brand decided to recall all Galaxy Note 7s and cease production. But even when Samsung issued the recall, in the US it did so without adhering to the US Consumer Product Safety Commission’s guidelines, causing more disruption for the brand. And that wasn’t all. As the crisis unfolded, it issued a statement to customers in Hong Kong assuring them that the phones used a different battery and were therefore safe, only to retract this statement the following day once this was discovered to be untrue. Lesson: By being slow to act and communicating misinformation, Samsung threw its brand reputation into question and, as the NY Times reported, “shaved as much as $14 billion off its market value”. This is nothing short of a PR disaster. True, it started as a manufacturing disaster, but the two soon became hopelessly intertwined. Acting quickly, showing the public that you’re committed to their safety, and focussing on getting the facts straight before publishing erroneous information are the key takeaways from this catastrophe. In the age of social media, brands have to be so careful about what they say and do on platforms like Twitter and Facebook where the whole world is watching. One of the most infamous examples of bad social media PR comes from Kenneth Cole, the man behind the lucrative fashion label of the same name. I of course have no idea who was in charge of Cole’s Twitter account at the time (2013), but, whoever it was clearly didn’t understand that the prospect of armed conflict was not a good tool for selling clothing. Controversial is not the word. And the PR team had clearly not learnt its lesson from a previous tweet that emerged in 2011, apparently poking fun at the demonstrations in Cairo during the Arab Spring. Lesson: While reacting quickly to what’s happening on the news or trending on social media and linking it to your brand can be good for publicity, attempting to capitalise on humanitarian crises, revolutions, war zones, or any other sensitive social issues is never a good idea. Causing anger is terrible PR. Errors of judgement are sometimes made, of course, but it’s essential that everyone – including all employees – who have access to a brand’s social media accounts are well-schooled on what’s acceptable. Cole owned his mistake and apologised. In the circumstances, that’s about all he could do – but, frankly, this should never have happened and the damage had already been done. Reputation management is at the heart of PR. As well as being in the age of social media, what brands have to realise is that this is also the age of smartphone cameras – and these have raised the stakes for corporate PR practitioners. As more than six million people viewed the handheld footage of a passenger literally being dragged out of his seat and down the aisle of a United Airlines plane by security personnel in April this year, you would reasonably expect United’s PR team to go into overdrive. The response, however, was less than exemplary to say the least. First, an internal email emerged blaming the passenger for being “disruptive and belligerent”. But it was United Airlines CEO Oscar Munoz’s authorised statement that really fanned the flames. Rather than accepting full responsibility for the incident and apologising unequivocally, commentators were quick to give their own interpretations of the statement. As they quite correctly pointed out, no apology is made for the violence that the passenger suffered, and the statement implicitly blames “the authorities” for the incident, meaning Chicago Aviation Security. The feeling was that United was trying to paint itself as an unwitting victim in the situation – and that did not go down well. Shares in United Holdings Inc. – parent company of United Airlines – fell 5% after the incident, wiping $1.1 billion off its market value. Lesson: The incident itself is one of the most catastrophic examples of bad PR perhaps in all of history. But it’s how the incident was handled in the aftermath that is just as striking. Nothing but an absolute, unambiguous apology was in order. Saving a brand’s reputation following something like this is always going to be an uphill struggle, but when you refer to a customer, apparently unconscious, being dragged around like a ragdoll as a process of “re-accommodation”, there’s very little that can be done to rectify the situation. The lesson is simply not to try and pass the blame and play the victim – the smartphone camera can see all and the internet will be the judge. Apologies when something goes wrong must be unambiguous, and it goes without saying that brands will do well to treat their customers as human beings in the first instance. Good PR is an art form. Sometimes, disasters will happen. And if they do, managing a brand’s reputation carefully and responsibly in the wake of the incident can make all the difference to the company’s future. If you would like to discuss your brand’s PR needs, then please don’t hesitate to get in touch with us here at Cope Sales & Marketing – www.cope-salesandmarketing.com. Looking forward to hearing from you.